The Northwest NeuroNeighborhood (NWNN) held its 5th Neuro-Networking event on February 25, 2014 6-8:30 pm at the offices of Stratos Product Development. An enthusiastic audience of neuro-entrepreneurs, including students from NeuroVentures ENTE 579 had the good fortune to pass questions back and forth with an exciting panel of local executives from our cluster. The panel was especially well received as each member represented a recent success in fund raising for a neuro-venture, and each took very different paths to that success. 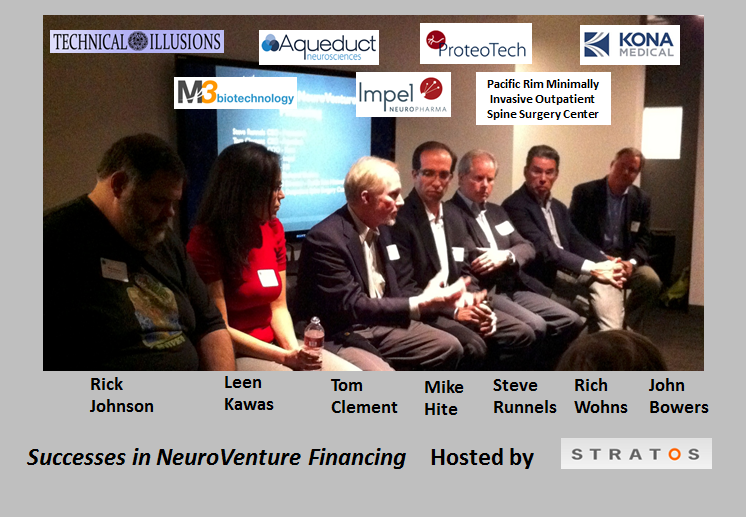 The panel’s seating unintentionally represented the disruption in financing, from a crowd-funding success story on the left (Technical Illusions) to a classic large VC backed financing on the right (Kona Medical). In between were representatives of Angel financing, “Whale” Angel financing, Advocacy Organization grant support, Federal grant and State grant support, and corporate investors. After introducing themselves, their companies, and their financing stories, the Panel reflected on questions including how to contact reclusive investors, and methods to win on-line financing. Networking before and after the 90 minute discussion was energetic and led to new contacts, as usual. The NWNN leadership announced open registration for the upcoming NeuroFutures 2014 Conference, which will be held in Seattle on June 17-18, 2014. Thought leaders in research, engineering, industry, and clinical domains will explore how the intersection of neurotechnology innovations in neuromodulation, brain mapping, neuroimaging, big data analytics, and brain computer interfaces will transform our understanding of neural systems and enable life-changing medical treatments. Bob Wilcox reported that this year the NWNN is collecting data on the scope of our industry cluster. Please join this effort, get access to leaders in the industry, and show your skills in market analysis. Contact Bob Wilcox (energyinvivo@gmail.com) and help us expand awareness of our important neuro-industry. August 2012 at the Allen Institute for Brain Science. February 2013 at the Center for Sensorimotor Neuron Engineering. July 2013 at the ACT Theater. This was the first meeting to include short talks on a disease theme, where we heard from three exciting local companies working on glioblastoma. November 2013 at K&L Gates Seattle offices where Brain Computer Interface was the topic. Bob Wilcox, CEO of Viket Medical, and and Northwest NeuroNeighborhood Co-Founder and Board Member.